GRID Alternatives' Energy for All program makes solar power accessible to families who need the savings most, while providing hands-on solar installation experience to volunteers and job trainees. We provide low-to-no cost solar electric systems to families that qualify as low income, and install them using a barnraising model that gives volunteers and job trainees hands-on experience they can use to get jobs in the growing solar industry. Each project has a triple impact: energy cost savings that help struggling families put food on the table or pay medical expenses; a classroom in the field for solar aspirants that supports local employment and the growing solar industry; and a reduction in greenhouse gas emissions that helps local governments reach their emissions targets and contributes to cleaner air for everyone. With an estimated 20 million low income, owner-occupied single family homes in the United States, we have a tremendous opportunity to support the continued growth of solar and the long-term transition to clean, renewable energy that will benefit us all. Get involved today by partnering, volunteering or making a donation to support our work. 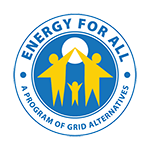 GRID Alternatives was selected by the California Public Utilities Commission (CPUC) to administer the Disadvantaged Communities - Single-family Solar Homes (DAC-SASH) program. The program will provide $8.5 million in incentives for households in environmental justice communities to go solar, with job training opportunities integrated into every project. As part of the California Department of Community Services and Development's Low-Income Weatherization Program (LIWP), GRID Alternatives partners with environmentally and economically disadvantaged communities to install rooftop solar for homeowners and provide hands-on skill building opportunities to volunteers.